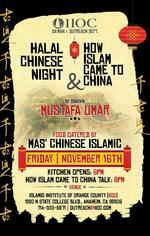 Join the IIOC Da'wah & Outreach Dept for Halal Chinese Night and How Islam Came To China. Talk will be led by Shaykh Mustafa Umar. Kitchen opens at 6pm and talk will start at 8pm.